Share the Path – Be courteous. Know the rules. Be responsible. be courteous. know the rules. be responsible. Multiuse paths are for everyone. If all path users follow a few simple ground-rules, pay attention, and communicate with each other, we can all use the path to have fun and get where we’re going safely. 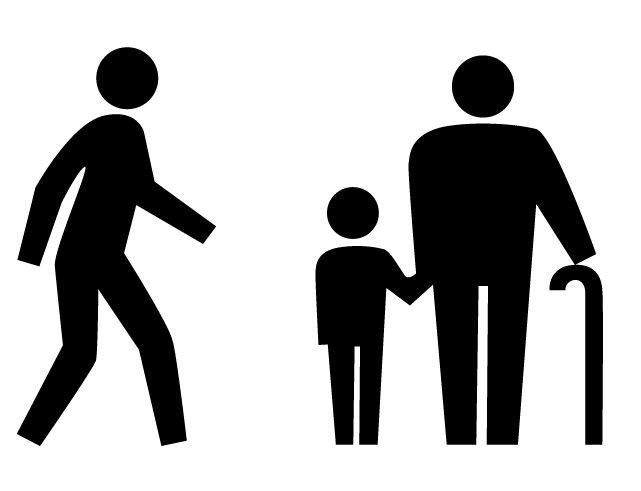 No matter which way you’re going on a shared path, keep to the right. Faster users should pass on the left. Keep things moving in both directions and make sure there’s room for others to pass. Please don’t stop on the path or travel more than two abreast. Tell them you’re coming! If you want to pass, clearly and politely communicate your plans to other users so that they have time to react. Pay attention. The first defense against accidents is being aware of your surroundings. Put your headphones and phone away so you can hear others who may want to pass. Be visible in the dark! Lights and reflectors on pedestrians, bikes, and pets let other users see where you are, especially at night or when visibility is poor. Wear reflective clothing. Know how the rules apply to you. Everyone must yield the right-of-way to horses. Bikes and skateboarders must yield to pedestrians. Walk or ride no more than two abreast or single file when passing. Don’t swerve around and between other users. When someone lets you know they are passing from behind, acknowledge that you heard them. Ensure your children know the pathway rules for the safety of themselves and others. Local codes apply. In all cases your dog must be under the direct and immediate control of a responsible person. 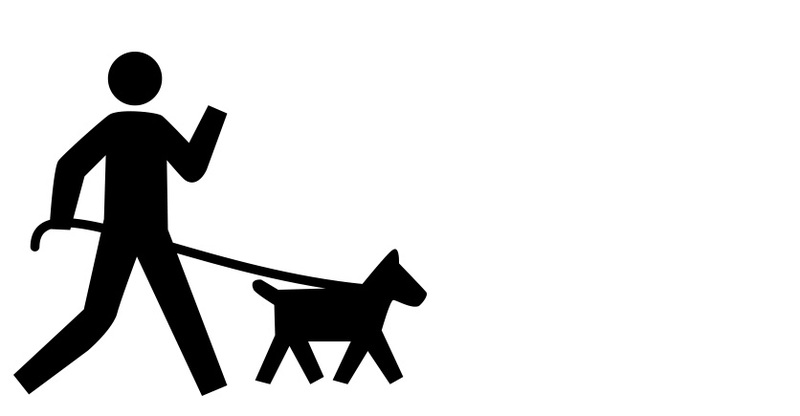 On paths managed by the County of Marin, dogs must be restrained by a leash not exceeding six feet in length, and neither the dog or the leash should block the path. Dogs must not enter environmentally sensitive areas, disturb people, or harass wildlife. With few exceptions (such as a commercial use license), there is a limit of three dogs maximum per person. Pet owners and individuals accompanying pets are required to clean up and remove pet waste. On multiuse paths managed by the County of Marin, the speed limit is usually 15 mph and is always whatever is safe under the conditions. In some congested areas identified by signs, the posted speed limit is 10 mph. Be prepared to slow when nearing or passing others. 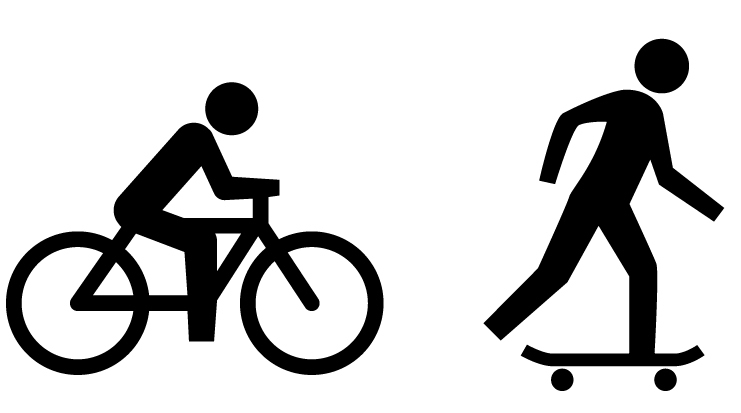 Your speed and style of riding should not endanger other users. If you want to ride at a speed greater than that allowed on the pathway, please use alternative routes better suited to your preferred speed. Be courteous. Know the rules. Accept your responsibilities. Anticipate what others will do next. 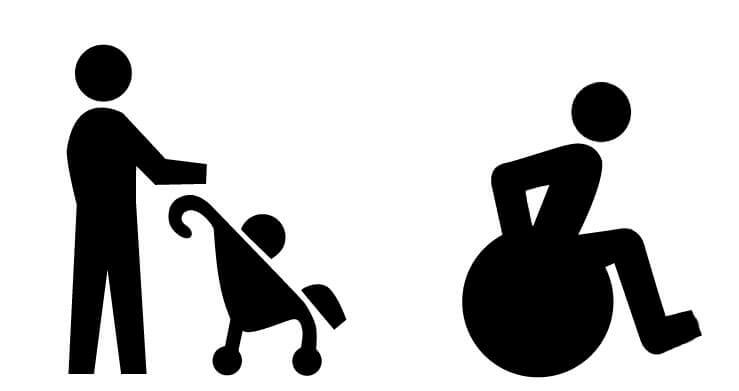 Kids and pets can be especially unpredictable. Give a clear signal by politely announcing “on your left,” or ring a bell well before passing. Keep in mind that some may not be able to hear you. You have the same rights and responsibilities as drivers. Obey traffic signals, traffic signs, and speed limits. Yield to pedestrians and horses. Stay as close as possible to the right-hand edge of the pathway, and pass on the left with ample space between you and others. clean up and remove pet waste. Share the Path was initiated by a partnership among the County of Marin, City of Mill Valley, and the Marin County Bicycle Coalition. 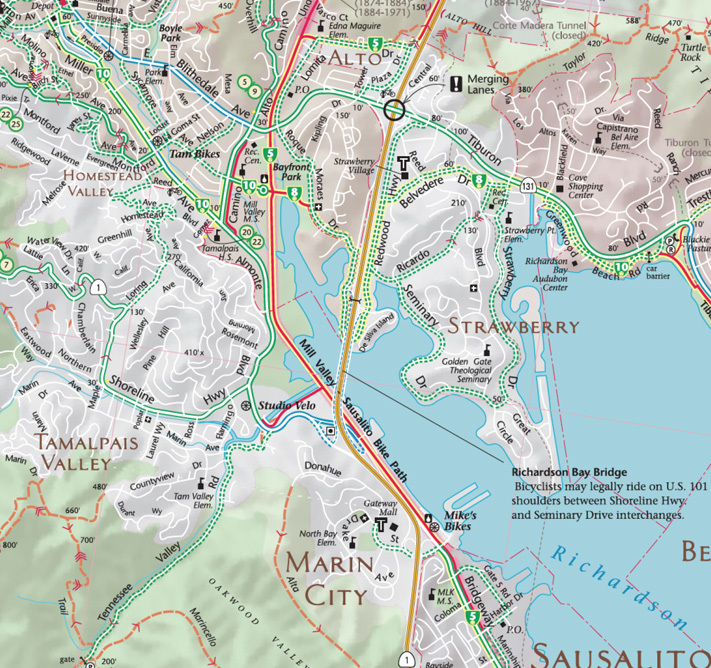 While partners were already working to improve safety, a serious accident on the Mill Valley/Sausalito Multiuse Pathway in September 2014 underscored the need for immediate action. This campaign aims to improve awareness, safety, access, and enjoyment for users of multiuse pathways across Marin County. This information is brought to you by a partnership between: County of Marin, City of Mill Valley, and the Marin County Bicycle Coalition. The campaign is funded by Measure A, the Marin Parks, Open Space and Farmland Preservation Transactions and Use Tax Ordinance of 2012. Share the Path, an education and outreach campaign, is one of four initiatives that the partnership is taking to improve access and safety on the Mill Valley/Sausalito Multiuse Pathway. Other initiatives include physical improvements to the pathway; regulatory changes including an enlarged “slow zone” of 10 mph adjacent to Bayfront Park; and increased enforcement of safety rules and regulations. 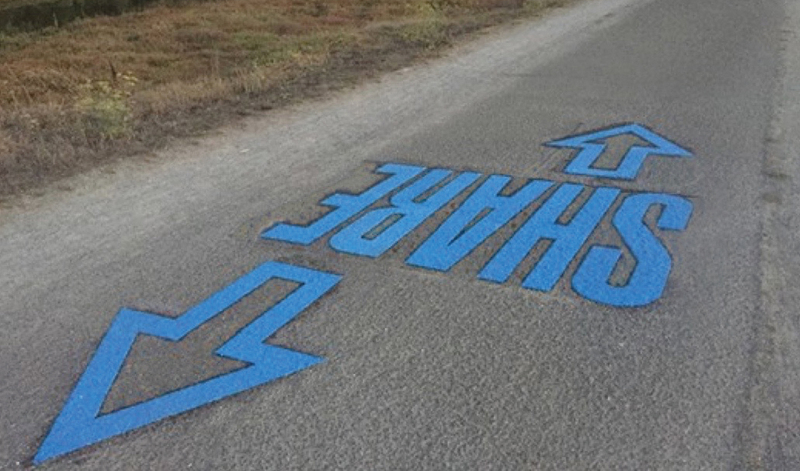 Pathway Improvements Underway To visually divide the path, center striping was added to the pathway between East Blithedale and Almonte in July 2016 as a pilot project, and in September 2015, street graphics emblazoned with the word “share” were also installed along with directional arrows. A repaving project from East Blithedale to Almonte is scheduled in Fall 2017 to resurface the path. If the center striping pilot project is deemed successful, the repaved path will include the centerline, as well as colored, stamped asphalt at 3 intersections and at the beginning of the 10mph slow zone. Additionally, railings on four bridges from Coyote Creek to Sycamore Avenue were renovated in December 2015 and a speed feedback sign was installed in July 2015. 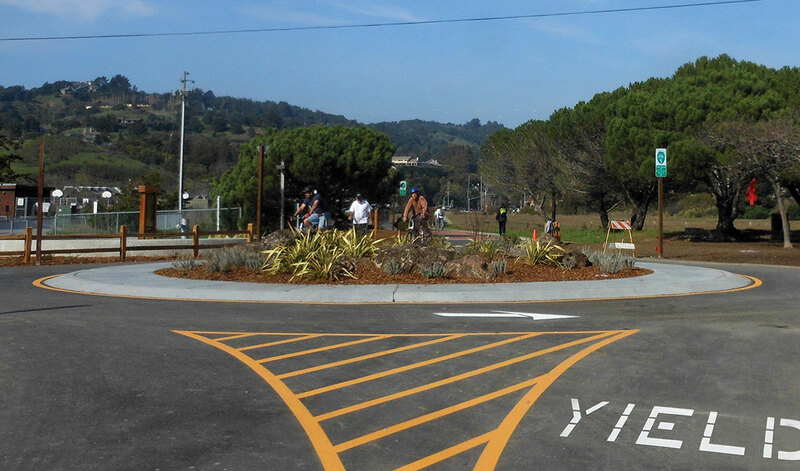 A roundabout intersection was completed in March 2015 at a high-use junction at the eastern edge of Sycamore Avenue on the Mill Valley/Sausalito Multiuse Pathway—the first of its kind on any Marin pathway. The roundabout, located in one of the busiest stretches of the multiuse pathway network, is designed to help slow people down and minimize user conflicts. Construction of the roundabout was funded in part by Parks and Open Space Measure A dollars as well as County National Model Program funds. Part of a larger maintenance project to improve safety and functionality of the path, the roundabout is the second in a series of pathway improvements. Last summer the City of Mill Valley added a multiuse pathway alongside the east end of Sycamore Avenue, which allowed users coming from Camino Alto to more easily connect with the main pathway. Understanding Use and Measuring Success A speed survey was conducted in May, 2016. Speed surveys will continue on an ongoing basis to help measure the speed compliance success over time. Using data from a visitor counter installed previously and the speed surveys have provided a wealth of information about the number of people using the path and speed trends. For the time period surveyed, the daily average use of the path was 2,718 people and the average speed in the 10mph zone was about 12mph. Additionally, an online visitor survey was conducted in summer 2015 gauging the success of the Share the Path education and outreach campaign, particularly the tabling outreach events and the new signage on the path. Survey results indicates that about 50% of those surveyed believe that the campaign has increased their awareness of how to use the path safely, and a little over 50% of respondents felt that the campaign has affected their feelings of personal safety on the path. Enforcement Efforts Targeted enforcement of the rules and regulations in key locations has also been a priority safety measure taken on the Mill Valley/Sausalito Multiuse Pathway. In addition to regular efforts, a Sheriff’s Deputy was hired to do targeted enforcement on the path approximately one day per month between January 16, 2016 and July 17, 2016. Most of the enforcement has focused on education measures, with 98 verbal warnings given and five citations issued. The Marin County Bicycle Coalition’s (MCBC) mission is to promote safe bicycling for everyday transportation and recreation. Since 1998, MCBC has worked to improve Marin County’s roads, multiuse pathways, and off-road facilities for cyclists and pedestrians with a goal of 20% of all trips in Marin to be made by walking or bicycling by 2020. The Transportation Authority of Marin administers Safe Routes to School (SR2S) programs to promote walking, bicycling, taking transit or carpooling to school; planning safer walking and bicycling routes to schools; funding the construction of safe pathways to school; and providing crossing guards at major intersections. From the Marin County Bike Coalition. Copyright 2019 Share the Path. All rights reserved.